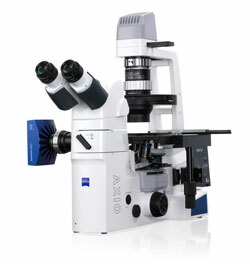 Axio Vert.A1 is a compact, inverted microscope that brings you big insights into your objectives. 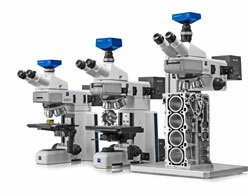 You examine large, heavy samples, using all the latest contrast methods without compromise. Or you might decide instead to increase your insights by combining several contrast methods. At a single stroke you switch between brightfield, darkfield, DIC, C-DIC, fluorescence and polarization contrast in reflected light. In transmitted light, use brightfield, polarization and phase contrast. You will be using a 5x encoded nosepiece turret as well as a light manager to capture light intensity and objective exchange automatically. That means you quantify your structure efficiently, evaluate the properties and quality of your materials, and then take appropriate measures. 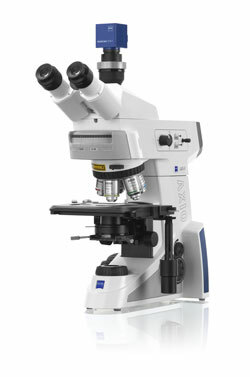 With a 23mm field of view you understand most of your sample from first sight. Having grain-measuring reticles equips you very well for instant measurements. You also have AxioVision Software by Carl Zeiss for a powerful range of modules such as grain size, phase analysis, layer thickness and interactive measurement for your investigations.